ReNew Issue 120 is out now! Policy: Is the solar multiplier still needed? Are electric vehicles really so great? David Coote responds to the question of wood heater emissions. It’s time for the federal government to reduce the upfront incentive for solar PV systems. But is this a good or bad thing? Damien Moyse investigates. Up to 50 West Gippsland businesses could be flying the sustainability flag by the year’s end, writes Maggie Riddington. A new ratings tool is set to provide a clear assessment of the sustainability of Australian infrastructure projects. Does it really make a difference to your emissions if you buy an EV but run it on fossil-fuel-generated electricity? Bryce Gaton investigates. There’s more going on in your meter box than meets the eye. Richard Keech examines the energy measurements associated with domestic PV systems. Lance Turner explains how to make that old PC run like new. A fresh look at materials reuse to create worm farms from municipal tip waste. By Tim Frodsham. Terry Tranter describes how to electroflocculate your water until it’s clean. The carbon price could make households and businesses better off if they take a few important steps. By Alan Pears. 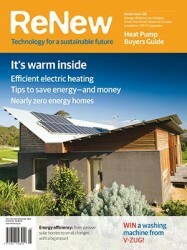 The ATA is publishing a free guide to energy efficiency on a budget. Get a preview here. Careful design has minimised the building and running costs of this rural Victorian house. By Tim Adams. An energy-efficient renovation of this family\’s living room is paying off, reports Danielle King. Living on a boat instead of a 40-square house can greatly reduce your environmental footprint. By Geoff Chia. Energy use has been slashed by ninety per cent at this school, thanks to energy efficiency. By David Coote. Even a difficult block didn’t stop Mike Stasse from building this net zero energy home. With plenty of water and not enough sun, Forest Walks Lodge installed a micro-hydro system. Rosemary Norwood describes the process and the benefits. Not all electric heating systems are the same. Lance Turner examines why heat pumps come out on top.